This gown came from an old playhouse in Chicage which had been open since the 20s, and recently shut down and sold there wardrobe. 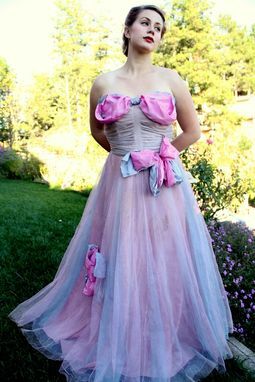 Vintage one of a kind gorgeous couture evening gown of pink and lavender tulle with beautiful big silk pink and periwinkle bows! One covers the entire chest and the other two are on the skirt. The dress is lined in pale pink silk. The bodice is gathered tulle over silk and the skirt is lightly gathered and paneled for an extra full sweep! The condition of the dress is not perfect, there are several small stains which I have not yet tried to remove, but the dress looks beautiful anyhow! I will be happy to try and remove the spots at your request.